Glitterbomb: The Fame Game #1 Review – AiPT! The Hollywood horror series is back with a new protagonist. Glitterbomb: The Fame Game #1 marks a new beginning for Jim Zub, Djibril Morissette-Phan, K. Michael Russell, and Marshall Dillon’s horror series that mixes celebrity culture with creature features. Much like the previous volume, this issue shows that sometimes the biggest monstrosities are just normal humans. Does The Fame Game get off to a good start? This issue begins right where the previous volume left off, which is a wise decision on the creative team’s part. By jumping right into the chaos following Glitterbomb #4’s bloodbath, the reader feels sensations of confusion and hyperstimulation. This mirrors the emotions felt by Kaydon Klay, who served as a supporting cast member in the series’ first volume but has now shifted to main character status. There’s a beautiful two-page-spread early on in the issue that depicts Kaydon and her new agent surrounded by dozens of journalists who visually coalesce like a wave, vibrating forward with countless cameras and microphones. Being flung into the spotlight has interesting effects on Kaydon’s character, as she struggles with the fame she’s always wanted. There’s a great one page scene in which Kaydon and her cab driver discuss how important she must be for so many people to want to talk to her. There’s little on the page beyond the characters’ faces and word balloons, but the simplicity works. Morissette-Phan does a great job capturing the characters’ emotions in the moment, and Zub’s dialogue cuts right to the heart of Kaydon’s emotional struggle: she wants to feel like she matters. Another positive aspect of this issue is Russell’s emotive coloration. His rendering of light sources is fantastic, and the various shadows and details on characters’ faces help to make them feel more real. It’s also good to see Detective Isaac Rahal return, although his scene feels a bit rushed. It’s nice to see so many returning characters from volume one, and the number of unresolved mysteries left is exciting and helps build momentum, but I wish this issue had moved the plot forward just a bit more. Even if major plot points didn’t progress much further, it would have been nice to get some more development for Rahal or Martina. With that said, the creative team still does a great job establishing Kaydon’s emotional state at this point in the story. Things already seem to be falling apart for her, and this volume has just begun. 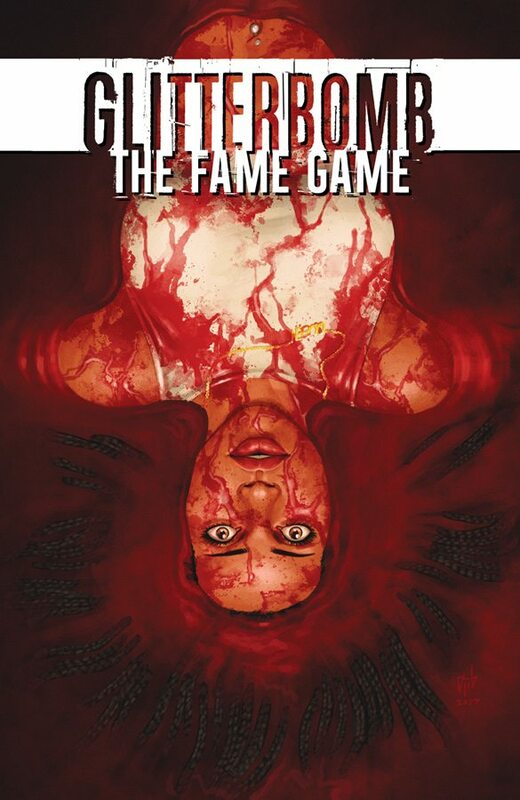 Overall, Glitterbomb: The Fame Game #1 is a promising start for the horror series’ second arc. We get some great focus on Kaydon’s character as well as her social life, and a sense of foreboding hangs over the whole issue. The bloodbath at the end of the last volume was likely just the beginning of more bloodshed to come. On the downside, I have a few qualms with this issue’s visuals (some details don’t remain consistent in the final scene, and there are a few splash pages early on that feel like they could have more effectively utilized their page-time) and I wish we’d gotten more development for the supporting cast members. Nonetheless, Glitterbomb: The Fame Game is off to a promising start, and I look forward to seeing how the volume moves forward from here. I have some qualms with this issue, but it's still a good time. The art team delivers strong work, and the writing leaves many mysteries open to ponder. This issue is worth a look, though it may not be as affecting if you haven't read the original series.